The past two months have been crazy at the Kitchen Table. In December we set new records for class sales and gift cards. January has brought tons of eager cooks and wine enthusiasts to our Table. All this has meant the time I wanted to spend experimenting with the CVap oven I won during the 2011 Starchefs ICC has been trimmed. The oven arrived at my back dock all wrapped in black plastic and on a palette. The delivery guy dropped it off and took off. He couldn’t help me any further. I took off the metal bands and with the help of my colleague brought it into the kitchen. Our instruction kitchen is not large and so the decision of where to put this new oven was tricky. We found out that it slid perfectly under one of our counters. We had to change the direction of one of our instructional tables so that it was no longer flush but we were able to make it work. My colleague and right hand man Tom looked over the oven and tried to imagine how it might be useful to him and he wondered aloud if it would get any use. I assured him it would be useful. We teach recreational students and it is true that none of them will ever use one of these ovens in their own home. However, I feel it is a great point of discussion in cooking protein. The premise of the oven is Constant Vapor at low temperature. The temperature settings do not go above 200° thus you are never baking above the boiling point of water. There is a water bath at the bottom of the oven that you fill manually. It has a little bobber that measures the water level and lets you know when you need to refill the water. The controls on the front of the oven are fairly straight forward. Temperature – Browning – Time. You turn on the oven, set the desired oven temperature, I skip the browning controls for now and set the time you want the oven to run that program. There is a HACCP button that allows you to see the temperature of the water bath and of the atmosphere in the oven (oven temperature). The first thing I did was to cook eggs in their shell. The oven is sort of like a Sous Vide machine without having to submerge any items in liquid. So I figured if I took whole eggs put them in a perforated hotel pan I could get the same effect that you get when you put eggs in 67º C water bath. After they are cooked you can crack the egg on the table and a whole perfectly poached egg falls out. The white of the egg maybe not set quite like you would get when you poached it in water but the yolk is perfectly runny. I brought those around to my staff who were incredulous at the site and blown away by the mouth-feel. I cooked Crème Caramels in perforated hotel pans (no bain marie required) and they came out amazingly smooth. I brought the temperature down to 105º F and made yogurt overnight. This obviously could be used to make Crème Fraîche as well. Cooking meat is a dream in this oven. I did a Burgundy class where we seared big 20 oz. Côte de Bœuf steaks (rib eye steaks on the bone) and then I put them in the CVap at 130º F and watched the internal temperature slowly rise to match the oven temp. When I cut into them to serve they were perfectly cooked all the way through and wonderfully flavorful. The vapor environment did not suppress the crust of the sear. I have yet to go at steaks the other way, which is to say put them in the CVap oven raw until they are cooked through and then take them out and sear them. I will try this soon. A few weekends ago, I cooked off whole tenderloins in the oven. I grilled the tenders to get a nice sear and char flavor and then put them into the CVap at 130º F. Perfect color from end to end and amazingly tender. 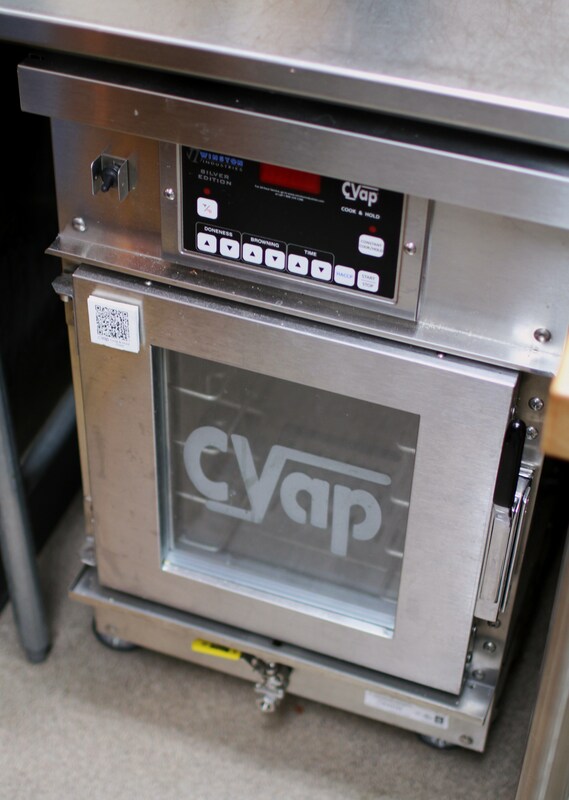 The CVap is not as versatile or as responsive as a Combi oven, but it also doesn’t carry a painful (as much as a car) price tag. You get all the benefits of low and slow moist heat cooking without having to fiddle with plastic bags or the limitations of space in a sous vide system. You can open the door and grab stuff whenever you want and can have multiple items working at the same time. The perfect accessory piece of equipment would be a Jade Plancha so you could get the desired sear you would want once your meat is at temp. This oven would be a steak house or burger joint’s dream. You could load it up with steaks or burgers before service and have them all sitting at 120º and sear them to order when you got a ticket. It doesn’t take up too much room and you can move it around to different parts of the kitchen. You could even remove the wheels and put it on a counter. When I was first introduced to this oven at the 2010 ICC, I was told by the rep that this is the way that Larkburger (a gourmet burger chain started in Denver) cooks off their burgers. There are so many items I want to cook in this oven. Short ribs, duck confit, whole hams, pork shoulder, crème anglaise, cheesecake, ox tail etc. It will be great to see how each of these items does in this compact oven. Just the other day after reading a post in the Winston Industries CVap blog, I decided to cook a top round of beef for 18 hrs. 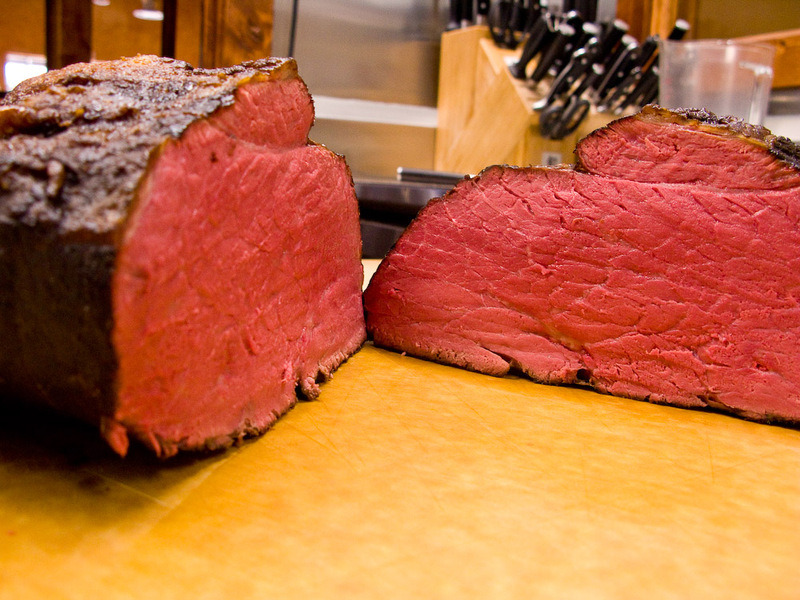 at 130° F. WOW, unbelievable quality roast beef. Perfectly red from one end to the other and maybe a maximum of an 1 oz of juice that leaked out of the roast. I quickly sliced some of the meat and made a rocking pannini with caramelized onions and provolone. I’m making corned beef next. 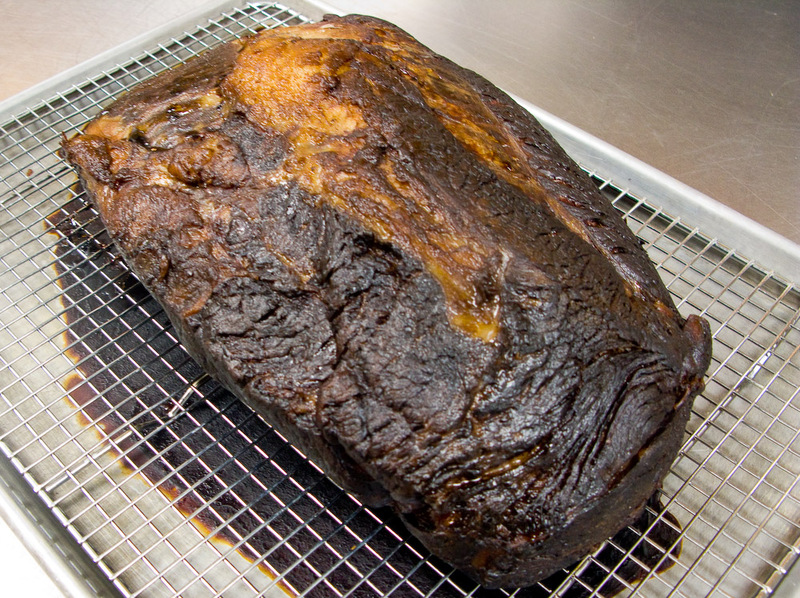 A whole brisket is in flavored brine right now and this coming Tuesday I’ll CVap it. Thanks so much for sharing your cvap experience. I run a cooking school out of my house in the Boston area, so I am in a similar situation to yours. CVAP produces wonderful results, but none of my students are going to buy one. I don’t have one currently, but I’ve seen what they can do at restaurants. I was wonderful about the practicality of putting one into my home kitchen. How big is your oven? How has the reliability and maintenance been? Are you still using it now that the novelty wore off? I use it occasionally as I am mostly office bound. My fellow staff members don’t quite get it. I have used it when teaching some of my classes and am amazed at how efficient it is. Did pot de creme at 200 degrees and it was firm and perfect at around 15 minutes. The unit fits under our kitchen counter but sticks out about 3 inches. It requires different voltage plug in which you have to configure in your home. Otherwise maintenance is minimal and it is very reliable. It can be a little tricky dialing in the exact temps and once you have it takes while to dial in another temperature. Combi ovens are a lot faster to respond. Thanks Andy! Do you have a combi oven too? What are some pros and cons between cvap and combi? Helen, I do not presently have a combi oven but I did at my last job. Even though it was an older model it was extremely easy to use. It had a thermometer probe so you could dial in the exact internal temp you would cook any meats. You could easily set the amount of moisture vs dry heat, so you could go from 400 to sear, open the door and blow out the heat and then drop the temp down to 180 for the rest of the slow cooking. That being said you can easily do most of those things with the CVap but it takes longer and it is not as obvious. Biggest difference is price point. Combi is about 20K and the CVap is 5K. You can move the CVap anywhere you have a 220V plug. Combi has to be hard plumbed. Helen, I am a district sales executive for Winston Industries, if you have any questions on Cvap technology, please feel free to contact me. gdwycoff@winstonind.com. Thanks.